Delivered in Presentation Primary School, following an inquiry from Principal Mrs. Maria Kelly, Moving Up is a drama programme designed to explore the thoughts and feelings of 6th Class pupils regarding their move to post primary school. 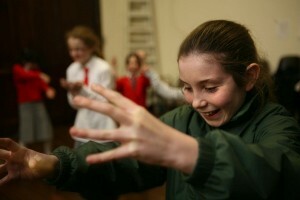 The programme was delivered over four ninety-minute sessions with a class of 28 pupils, with class teacher Mairéad Cummins present throughout. The first three sessions took place in the gym and the last session was held in the classroom. The first session looked at the pupil’s journey through primary school. Using memory and group exercises each pupil told the story of ‘their journey through primary school’, using Sculpting, Tableaux and Dynamisation to explore their feelings around particular memories. As a group they were brought from Junior Infants to where they are now. As pupils offered thoughts in the tableaux, the class discussed and shared these memories. Using the same drama methodologies, each pupil made a tableau to show how they were feeling about finishing in primary school. Discussion was integral to the session. The fear of moving from a position of ‘top’ of the school to being at the ‘bottom’ was a recurring theme. Inspired by the recurring theme, the second session worked with the pupils to explore Status. Through activity and discussion they looked at the physical traits of various statuses, how we portray status, how others endow us with status. They explored the differences between societal status and personal status. There was discussion around the sometimes-blurring lines of arrogance, aggression and assertiveness and their relation to ‘high’ status. Pupils had fun with some script excerpts where the relationship inferred a particular status such as ‘teacher/pupil’, ‘parent/child’, ‘customer/waiter’. They then played the scenes inversing the societal status e.g. the pupil being higher status than the teacher. The third session projected the pupils into the future. They formed pairs – one was a new first-year student and the other character was someone that s/he could talk to. They then gave the student one hope and one fear about starting in post primary. With a prepared tableau from a previous exercise as a starting point, the pairs played out the ensuing one-minute conversation. The group then broke into two – an inside circle and an outside circle. Those on the inside of the circle were the ‘Experts’ and those on the outside of the circle had a question that they wanted to ask about moving to post primary. Each ‘Expert’ had one minute to offer an answer or advice. Each question was answered by at least 10 ‘Experts’. There was feedback about the types of questions that arose and the different answers or advice given. In the fourth session, the pupils were introduced to four ‘characters’, inspired by fears that had emerged in the previous session. Each ‘character’ situation was discussed in small groups. They wrote and presented a short scene to demonstrate the character’s predicament. Each ‘character’ situation was discussed and this was followed by each group writing a letter of advice to the character. The pupils were fully engaged in the sessions and the topics explored which in turn provided stimulus for further discussion outside of the drama sessions. The programme could not have happened without the openness and support of Principal Mrs. Maria Kelly, Ms Cummins and the 6th class pupils of 2011.